There aren't too many things growing in my space now-a-days, except a small pumpkin that's taking shape, and a few velvet beans (kawach) growing on the vine. The small pumpkin has worked up wonders in boosting my confidence to again sow it up next year too, so have the 10-12 velvet beans that have been able to make it up to grow. The pumpkin seed made way to the container from pumpkin my mother brought as vegetable. One seed made way to the container and it germinated and became a plant. It bore a lot of flowers and a number of fruits but none of them survived enough to mature enough. 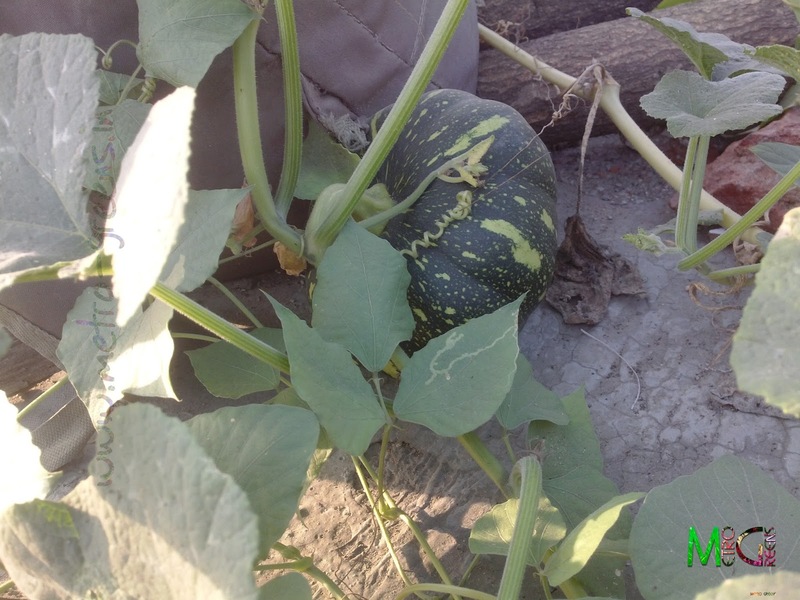 Just when I had lost hope for a fruit, and completely ignored the vine, that had climbed up on the roof, my father, recently spotted the small pumpkin in the vine. And now, it's in front of you all. A small pumpkin, a huge opportunity! The case of the velvet bean (Mucuna pruriens) vine is somewhat similar to my yardlong beans vine. 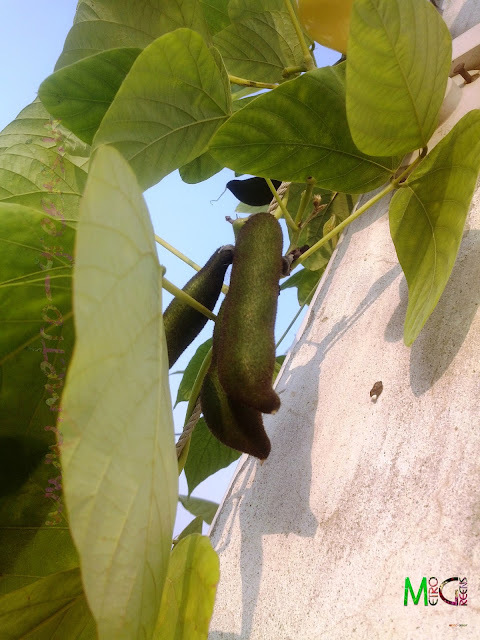 The seeds of this too had accidently come in some pulses or lentils and just like the yardlong beans seed the velvet bean seed too found its way to the container to be grow, and add up some greenery to my rooftop landscape. The flowers aren't very appealing as this vine bears dark purple coloured flowers, that, at first appeared to me like the beans itself. 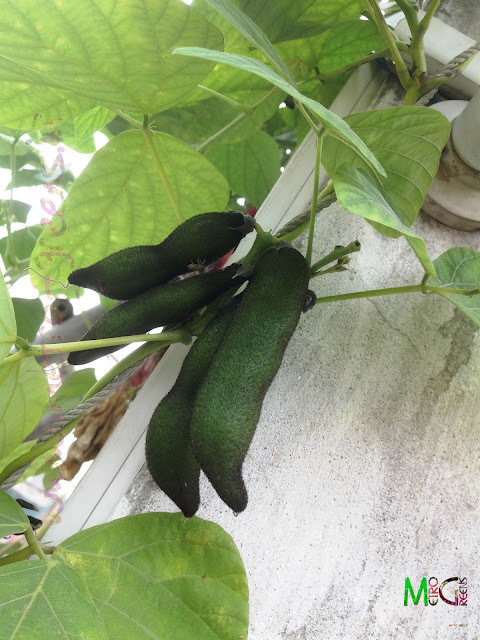 The beans are green in colour with dark coloured hairs on the skin of the fruit, that give it a velvety appearance. These hairs contain a chemical which creates an itchiness on the skin when touched. 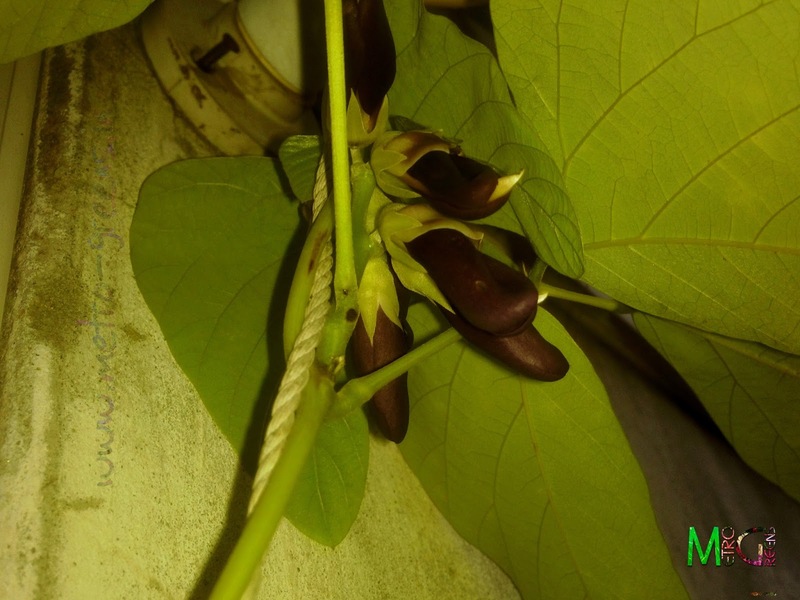 The seeds of this plant have a great medicinal value and are considered quite good in Ayurvedic medicine, owing to its medicinal properties. Some blooms of the velvet beans. Some velvet beans, and a small spider on the guard! For now, I have some upcoming blooms in my chrysanthemum plants, which are due to come up in the next 7 to 10 days, so, I'll be back with some more blooms to share with you guys in the next post. Till then, keep visiting and HAPPY GARDENING!